While the earliest communications innovations had tens and even hundreds of years between them – from the invention of the telephone in 1897 to the first WAP-enabled handset – innovations in smartphones have only been gathering pace. But he highlighted that only 12 per cent of UK consumers have actually bought a product on their mobile phone – including downloads and other digital content. “Only 11 per cent of purchases made in the UK are online. That means 90 per cent are still in physical stores. What people are doing,” he said, “is using their mobile phones to interact with the physical environment.” The top activities are locating a store to check opening hours, researching a product and taking a picture. “People are not in a massive rush to buy on mobile – what they want is help with their physical purchase. “Whatever you call it – a game changer, the glue or the link – mobile is bringing the best of the physical world and the best of the digital world together to influence consumers in different ways. Brands have the opportunity to touch every different aspect of the customer life cycle. So what does Forrester predict for the future? “The future of mobile is absolutely about context. Brands can create mobile unique experiences that only exist because of what the person is doing and the fact that the phone can interact with their environment.” He outlined that the controls, displays and opportunities for data collection will only get smarter, offering the potential for things like biometric security, image projection and chemical sensors for food. But he said there are simple bits of context that can be better used today. Location, time and making use of user set preferences can all help create a personalised experience. “Are they in store, are they in a competitor’s store, are they about to get on a flight?” Walmart, for example, delivers an app customised for when a customer is in store with content relevant to where they are. Distance, depth, aisle, floor, direction and what time of day it is could all be put to use in the near future. “If you were IKEA, you could already know the colour scheme or a room – what colours match? How big is the room? How much do I have in savings? When can I have it delivered? Which stores deliver to my house? “What we do know is it’s coming at such a fast pace that the level of innovation that the next five years is going to bring will be frightening. And the mouse is dead. There are new ways of interacting with technology and we are not tied to the old user input. We can deliver new user experiences, mobile user experiences. This entry was posted in forrester, mobile, Mobile Marketing Magazine, MRS 2013, retail on April 24, 2013 by kirstystyles1. A women’s consumer magazine with mCommerce built in has been unveiled in the same week that Bauer has closed the doors at print magazine More!. Digital Space has announced the launch of the free iLove interactive women’s magazine and app, which will be delivered direct to a selected audience of 700,000 households from July. The editorial content and advertising in the monthly mag will all contain multimedia elements, with a particular focus on driving women to download the app, scan products and buy them on the spot. The company has used data modelling with the help of Royal Mail to identify women who like fashion and beauty and also own a smartphone to ensure that the people targeted will be keen to purchase the products. The company will be able to track scans and purchases made via the app, making them directly attributable. The audience will be more than double those of Cosmopolitan and Marie Claire, as well as the free magazines from Stylist and ASOS. Will women be able to argue with a free mag with interactive content selected with them in mind delivered straight to their door? It is also available to a wider audience online and in email editions. This entry was posted in interactive, magazines, mcommerce AR, mobile, Mobile Marketing Magazine, retail on April 23, 2013 by kirstystyles1. Microsoft has announced revenue of $20.49bn for its third quarter ended 31 March, an increase of 18 per cent year-on-year. The Entertainment and Devices division, which includes Windows Phone devices and with games console, posted revenue of $2.53bn, an increase of 56 per cent from a year earlier. The Windows division, including Surface tablets and PCs, saw a year-on-year revenue increase of 23 per cent to $5.7bn. Although Windows Phone is trailing far behind Android and iOS, Steve Ballmer, CEO, said on an earnings call that he is happy with its performance so far: “Momentum with Windows Phone continues to build. The device is now available in a broad range of price points. We’re receiving great reviews and carrier support continues to grow. The company’s CFO, Peter Klein, who is stepping down at the end of the financial year, said he expects the final quarter revenue growth in the Enterainment and Devices division to be in the mid-teens. In the Windows division, he said that manufacturer revenues will be hit by declining sales of PCs but it will be working to increase its tablet share. “The biggest thing we’re doing is helping OEMs develop new and improved user experiences across the board, across size, across price point and deliver a really compelling Windows 8 experience,” Klein said. “And it’s not just the devices. It’s chips, it’s the apps, it’s the buying experience, it’s the user interface. So we’re really focused on all five or six of those dimensions going forward. This entry was posted in earnings, Microsoft, mobile, Mobile Marketing Magazine, windows 8 on April 16, 2013 by kirstystyles1. At a pub quiz a few weeks ago our team had an average age of 30(ish), with only my boss (yes I spend my spare time at quizzes with my boss) over the age of 50. We decided that we’d try to double our points on the noughties round – steering well clear of the 70s ‘mum and dad school reunion round’ – as it was the decade that most of us remembered most clearly. Yes – we could have gone for the 90s… Perhaps if we were cooler, we would have. So we powered through Vampire Weekend and Kelly Clarkson and bumped ourselves up from second-til-last to fourth. Hey, we didn’t win, but we were nearly on the podium. Think about how those guys in second place felt, knowing how close they were to stealing victory. Anyway. During That 70s Round, my boss exclaimed: “How do you not know who Boney M are?! ?” “Err… I recognise the name but maybe because I wasn’t alive in the 70s? And nobody seems to mention them in passing..? And I don’t listen to Smooth and 6Music doesn’t seem to remember them either..? Wikipedia, knower of most things, knows that “the group was formed in 1975 and achieved popularity during the disco era of the late 1970s. The group has sold more than 150m albums and singles worldwide with most sales in the UK and Germany.” So Boney M is plural. Who knew? So just as my boss was surprised about this, many have taken to Twitter today to pour scorn on many of its younger users who didn’t (or lolz pretended they didn’t) know who Margaret Thatcher was. She became head of the Conservative Party (or the Tories, as they are now more popularly known) in 1975 and was succeeded by John Major in 1990. Anyone 23 and younger obviously never experienced life under Thatcher and they don’t really teach politics at school either – lest we actually all understand what the hell is going on. The Future Project: What is the ‘left’ and ‘right’? Why is our population ageing? Who makes the decisions? The Future Project attempts to answer these questions in an easy-to-follow, interactive and fun way. Think Brian Cox, but with politics rather than planets. It is for those of you who want to watch Question Time, but first you need to know why these issues matter and what they mean for the future. If you know who Nick Griffin is, but don’t know where his views come from, or you know that the climate is changing, but don’t understand when or why it will affect you, this is the show for you. All the topics discussed over the series are genuine concerns put forward by you, addressed in a non-political way. By the end, you should be able to understand current affairs and make more informed choices about voting and about your future. If these Twitter admissions show us anything, it’s that some young people have the whole world at their fingertips but have no idea who some of the people that shaped their lives are. They do not even know we had a woman prime minister – no wonder female representation in parliament is still woefully low. But how do you know what you’re looking for if you don’t know what you’re looking for… or aren’t really looking? And where can you go for impartial political information? 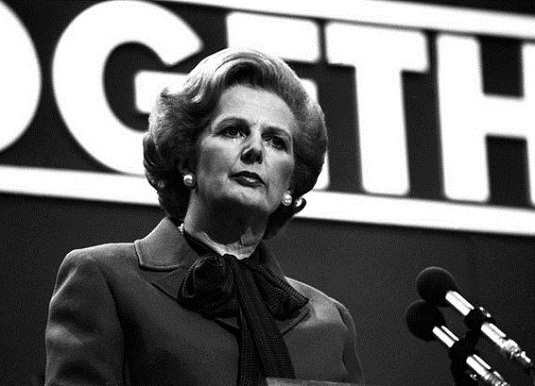 As it has been acknowledged throughout the day, Margaret Thatcher was a divisive political leader, hated by many on the Left, celebrated by many on the Right, with many others impressed, upset and elated. But you have to know your Left and Right before that means anything to you and it is very hard to get unbiased facts from either side. And even to get ‘truth’ and ‘fact’ from the media – where Mail and Times readers alike go for their ‘own brand of objectivity’ – it depends on who’s telling you. What they keep in, what they leave out and at which points they give you a knowing italicised word. So you’d think the BBC would be the perfect spot for this kind of information, but alas, no. ‘Head to Twitter’, I hear you cry, ‘hey, the BBC has now placed a Twitter feed firmly at the centre of its new news operations’, but we all know that is just awash with Left and Right leaning know-it-alls and bemused teenagers who don’t know how to use Google. I blame Tony Blair – surely you know who he is? But what does it matter anyway? She’s dead. Let’s just say, she was made out of iron, she hated women and although she never lost a general election (? ), she didn’t have as many hit records as Boney M. And her name isn’t as funny. Spoon-feed us stuff about the Tudors at school and give us unadulterated access to Youtube and you’ll get the young people you deserve. This entry was posted in boney m, politics, Thatcher, Twitter, young people on April 8, 2013 by kirstystyles1. A platform that turns your ‘missed call’ into a signature on a petition is now being piloted in Rio, Nairobi and Bangalore after reaching its $15,000 goal on Kickstarter. 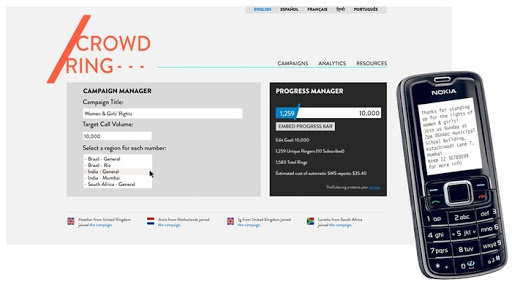 Inspired by an Indian campaigner who encouraged people to log 35m missed calls against local corruption in just two weeks, /Crowdring has now been created as scalable platform by Purpose, /TheRules and ThoughtWorks, a digital campaigning coalition. Users log in online or on mobile and create a petition linked to a local phone number. After logging their missed call, the person receives a free SMS in their local language that shares key facts about the campaign and how they can get more involved. It doesn’t require any credit and works on any handset. After the campaign has been advertised and completed, the activist can then present their mobile signatures to politicians. The platform enables data aggregation, list cutting and a cost-effective way to purchase local numbers for each campaign. It is open source so can be integrated and updated by developers wishing to use it. Free ‘missed calling’ is a particularly popular way to send messages in emerging markets where calling rates can be costly. /Crowdring will now be working for the next three months running three social justice campaigns in its chosen test countries, with training for 15 community organisers. The pitch on Kickstarter says: “We believe that /Crowdring has the potential to become the easiest and cheapest way to bring the world together around social justice issues. /Crowdring facilitates two-way correspondence that is free for the user, and can be scaled across cities and continents. Purpose, /The Rules and ThoughtWorks are a group of activists, technologists, campaigners and designers based in NYC, with partners in Brazil, India, and Kenya. They are working with campaigning organisations in its three host countries called Meu Rio, Jhatkaa and Infonet. This entry was posted in /crowdring, crowdsourcing, kickstarter, mobile, Mobile Marketing Magazine, politics, purpose, startups, technology on April 2, 2013 by kirstystyles1.